Control systems integrate elements whose function is to maintain a process variable at a desired value or within a desired range of values. 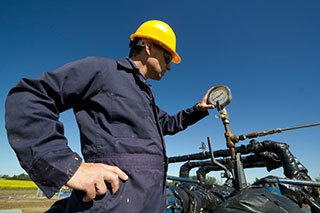 Instrumentation provides the various indications used to operate an industrial facility. In some cases, operators record these indications for use in day-to-day operation of the facility. The information recorded helps the operator evaluate the current condition of the system and take actions if the conditions are not as expected. Requiring the operator to take all of the required corrective actions is impractical, or sometimes impossible, especially if a large number of indications must be monitored. For this reason, most systems are controlled automatically once they are operating under normal conditions. Automatic controls greatly reduce the burden on the operator and make his or her job manageable. Process variables requiring control in a system include, but are not limited to, flow, level, temperature, and pressure. Some systems do not require all of their process variables to be controlled. Think of a central heating system. A basic heating system operates on temperature and disregards the other atmospheric parameters of the house. The thermostat monitors the temperature of the house. When the temperature drops to the value selected by the occupants of the house, the system activates to raise the temperature of the house. When the temperature reaches the desired value, the system turns off. Automatic control systems neither replace nor relieve the operator of the responsibility of maintaining the facility. The operation of the control systems is periodically checked to verify proper operation. If a control system fails, the operator must be able to take over and control the process manually. In most cases, understanding how the control system works aids the operator in determining if the system is operating properly and which actions are required to maintain the system in a safe condition. A control system is a system of integrated elements whose function is to maintain a process variable at a desired value or within a desired range of values. The control system monitors a process variable or variables, and then causes some action to occur to maintain the desired system parameter. Two terms which help define a control system are input and output. Control system input is the stimulus applied to a control system from an external source to produce a specified response from the control system. In the case of the central heating unit, the control system input is the temperature of the house as monitored by the thermostat. Control system output is the actual response obtained from a control system. In the example above, the temperature dropping to a preset value on the thermostat causes the furnace to turn on, providing heat to raise the temperature of the house. In the case of industrial facilities, the input and output are defined by the purpose of the control system. Knowledge of the input and output of the control system enables the components of the system to be identified. A control system may have more than one input or output. Control systems are classified by the control action, which is the quantity responsible for activating the control system to produce the output. The two general classifications are open-loop and closed-loop control systems. An open-loop control system is one in which the control action is independent of the output. 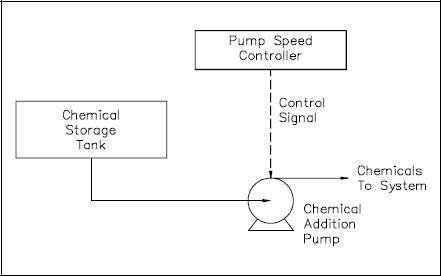 An example of an open-loop control system is a chemical addition pump with a variable speed control (Figure 1). The feed rate of chemicals that maintain proper chemistry of a system is determined by an operator, who is not part of the control system. If the chemistry of the system changes, the pump cannot respond by adjusting its feed rate (speed) without operator action. A closed-loop control system is one in which control action is dependent on the output. Figure 2 shows an example of a closed-loop control system. 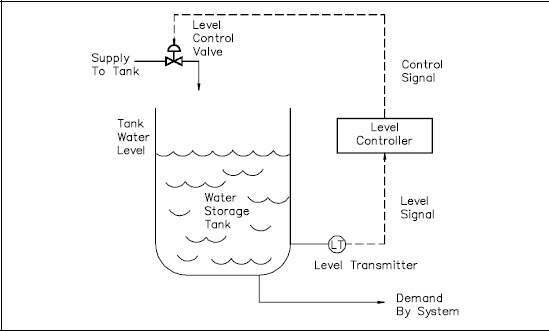 The control system maintains water level in a storage tank. The system performs this task by continuously sensing the level in the tank and adjusting a supply valve to add more or less water to the tank. The desired level is preset by an operator, who is not part of the system. Feedback is information in a closed-loop control system about the condition of a process variable. This variable is compared with a desired condition to produce the proper control action on the process. Information is continually “fed back” to the control circuit in response to control action. In the previous example, the actual storage tank water level, sensed by the level transmitter, is feedback to the level controller. This feedback is compared with a desired level to produce the required control action that will position the level control as needed to maintain the desired level. Figure 2 shows this relationship. For more information on Control Systems, sign up for our online training at www.myodesie.com or contact us at sales@techtransfer.com for a class at your facility.